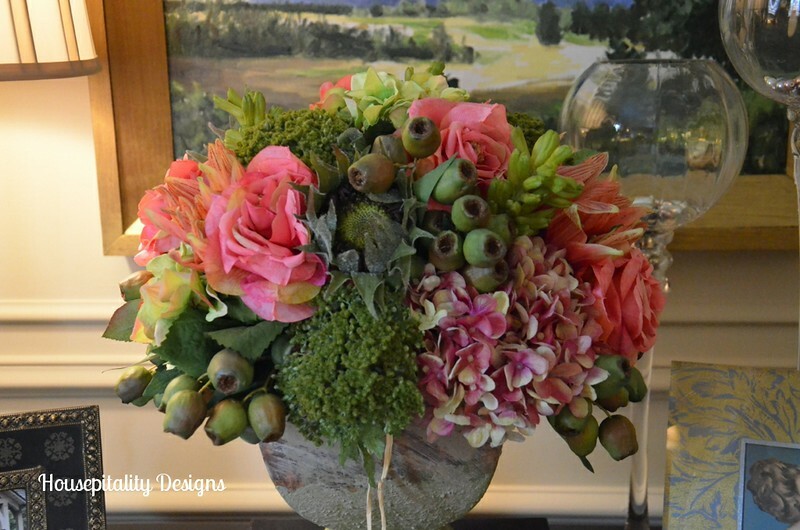 Mother Nature has been kind to the flowers lately..
…..with the tremendous rains many of us have been experiencing. After the heavy rains stopped today I was able to snap a picture of one of my Irises that are just now blooming. 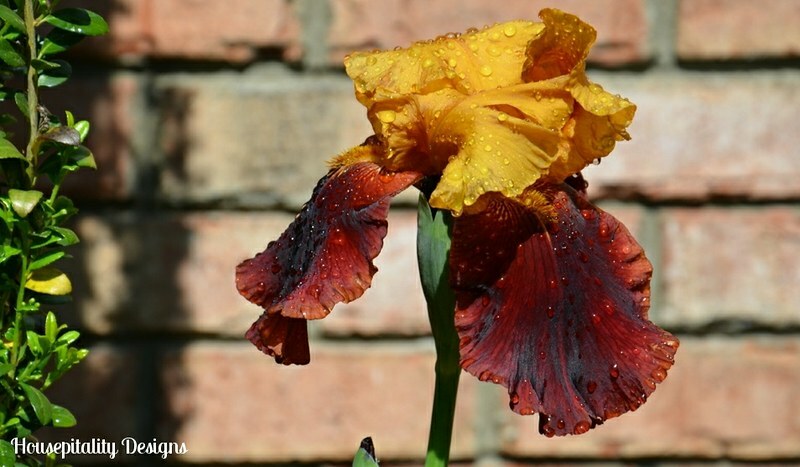 The drops of rain are so pretty on the Iris. 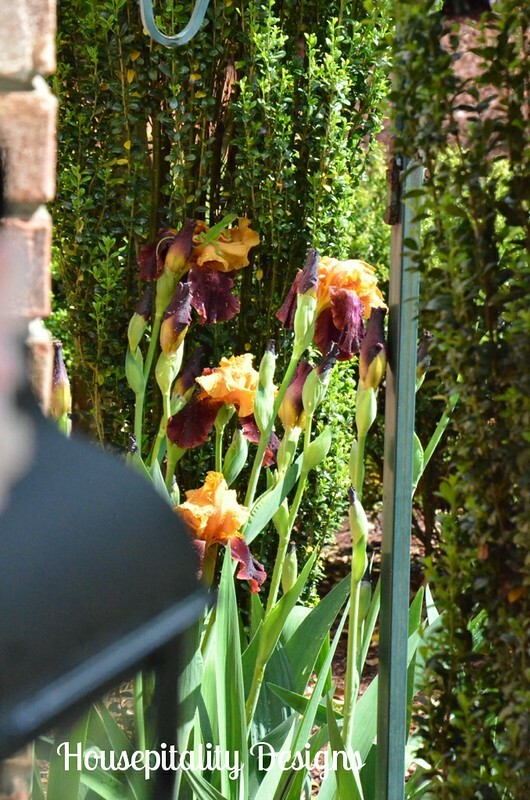 I was drawn to the beautiful colors of this Iris many years ago. I will get a better pic of them when they have not been beaten down from the rain!! 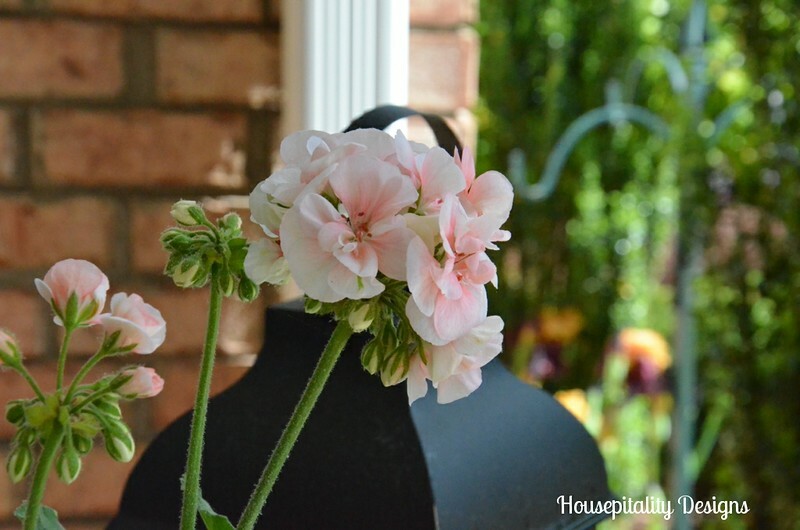 …..the flowers are doing their happy dance…thus making us happy! So many beautiful signs of Spring and I cannot wait to plant more flowers in our empty flower beds. 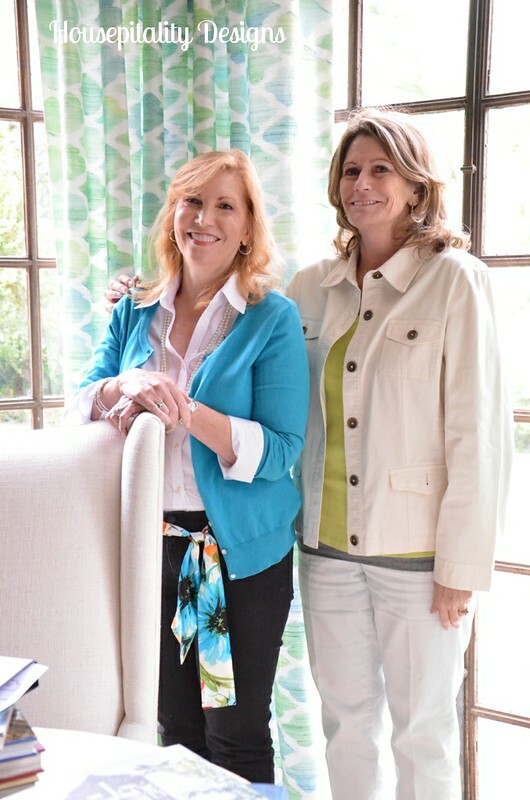 …..the first time I went with fellow bloggers/friends which was part of one of the High Point Market events. This time I went another group friends…the house was so beautiful that I wanted to see it again. 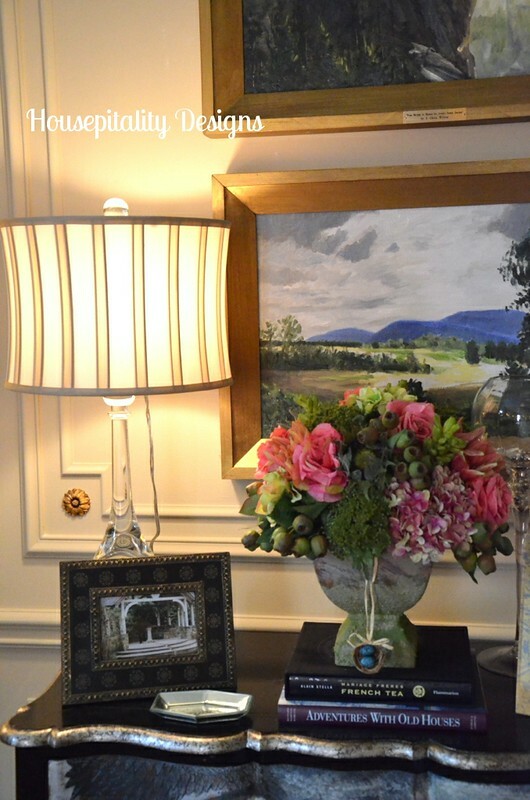 At this visit, I really took notice of the gorgeous silk arrangements throughout the house. The quality of the silks really made you look twice to see if they were real. 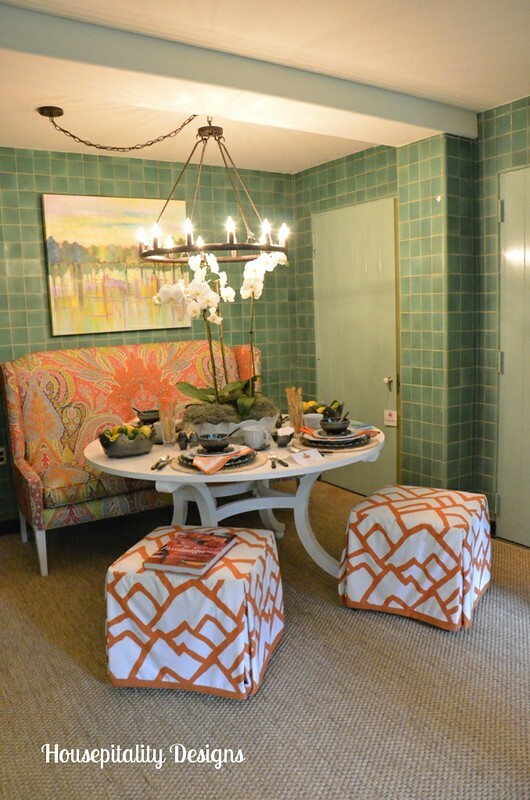 All of the arrangements were impeccably designed for each room. 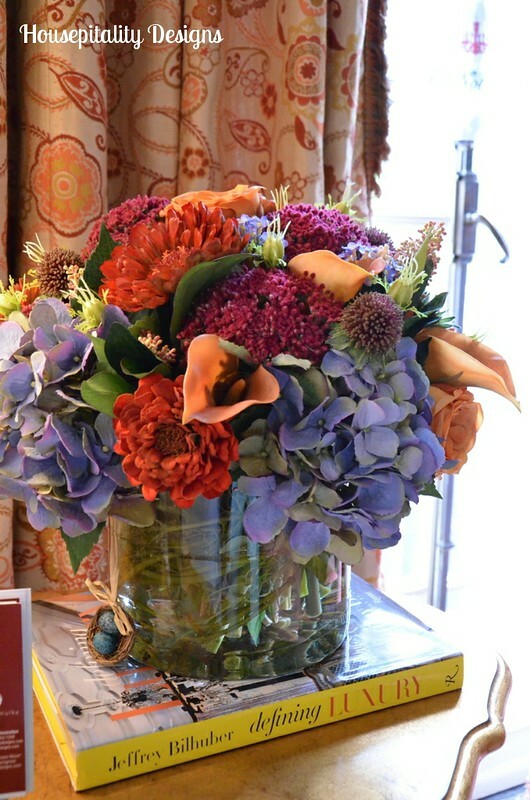 There were arrangements of strong, bold colors and those with soft muted colors as this one. 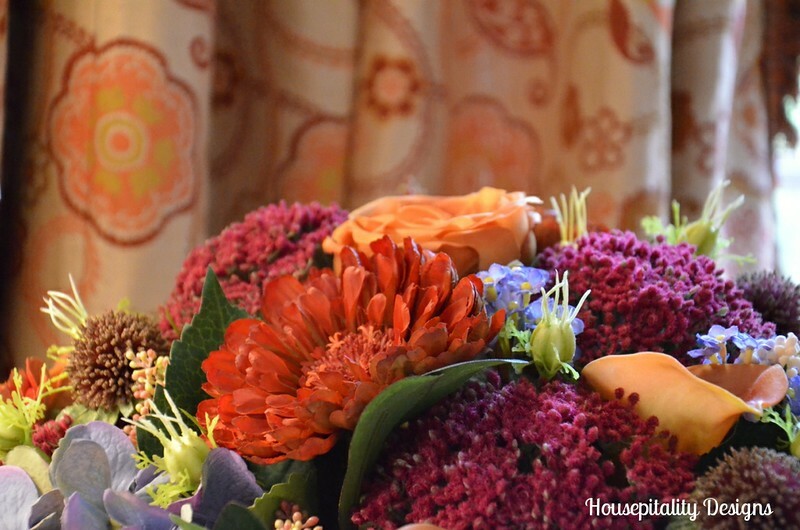 …..however, they were magnificent faux blooms. 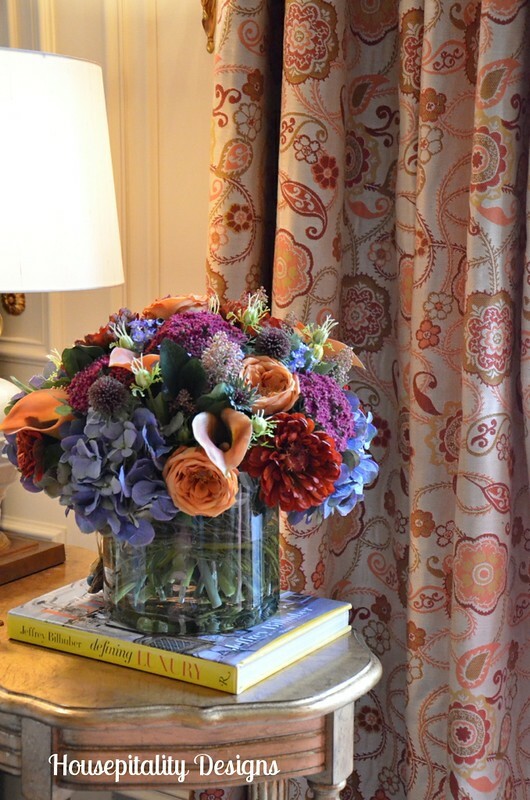 Each arrangement were in exquisite containers…and they often were paired with beautiful decorating books. 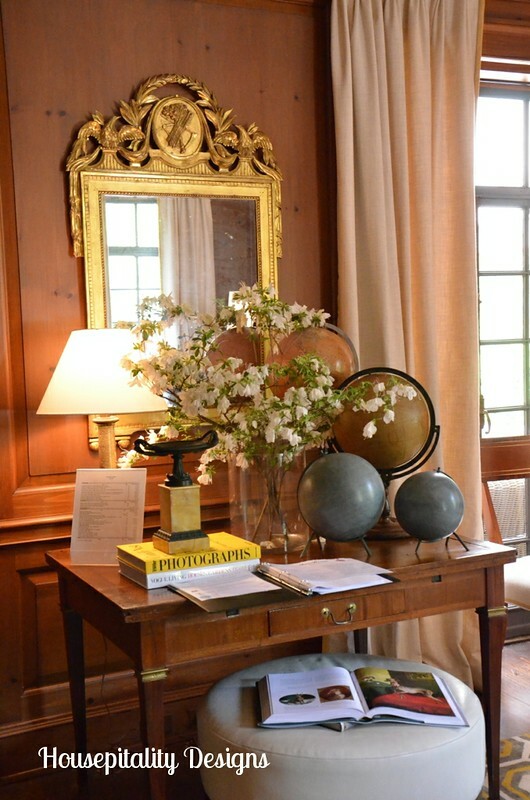 The docent said that this was Amelia Earhart’s favorite room…. 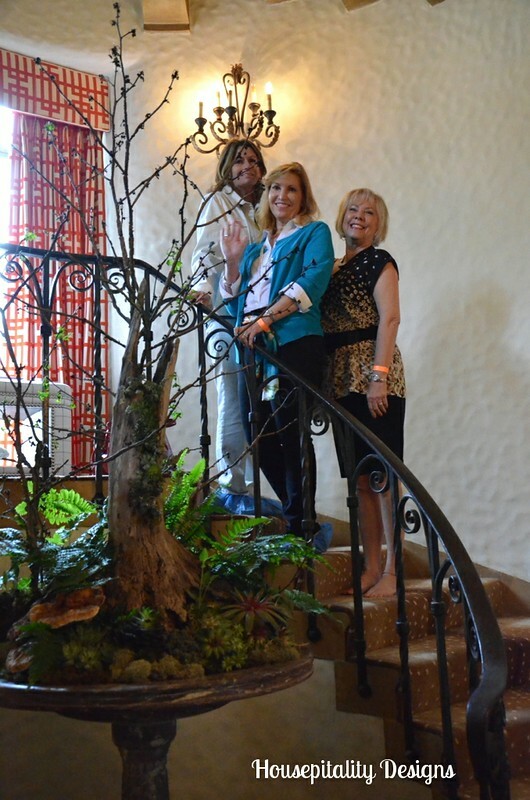 …..yes, she was a guest in this magnificent mansion of 15,000 square feet. 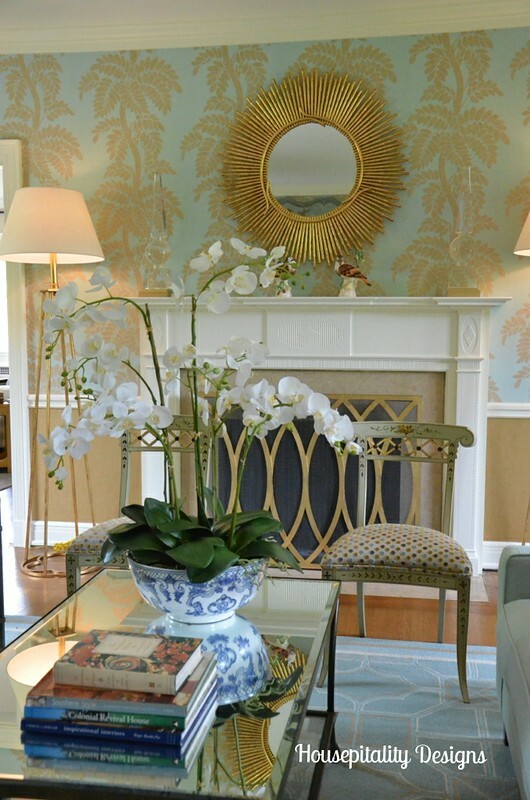 There were many fabulous orchids…all faux. 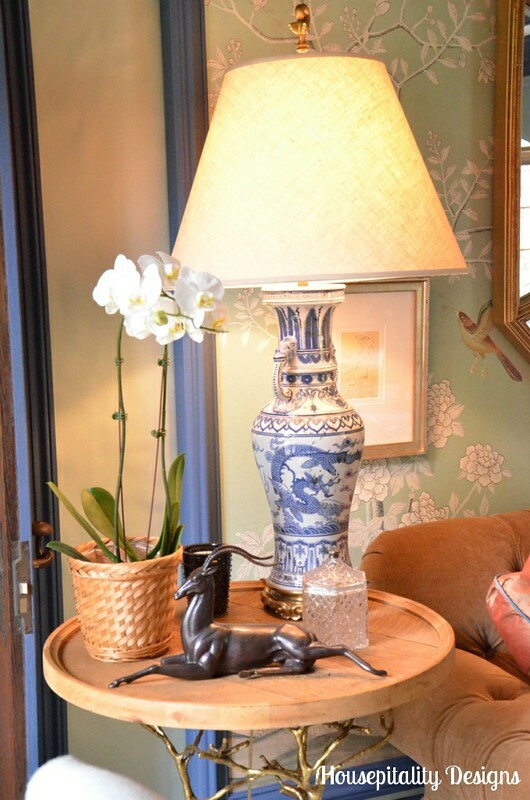 This happened to be a real orchid placed in this beautiful vignette. 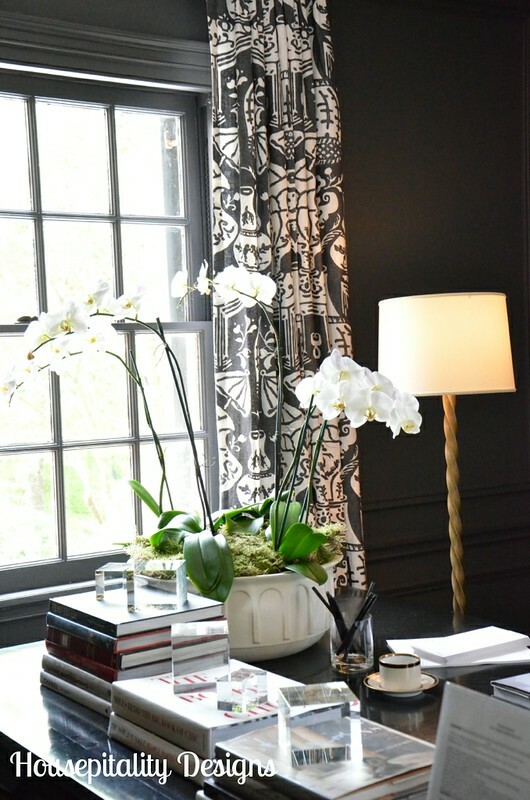 A faux orchid on the table in the sunroom. 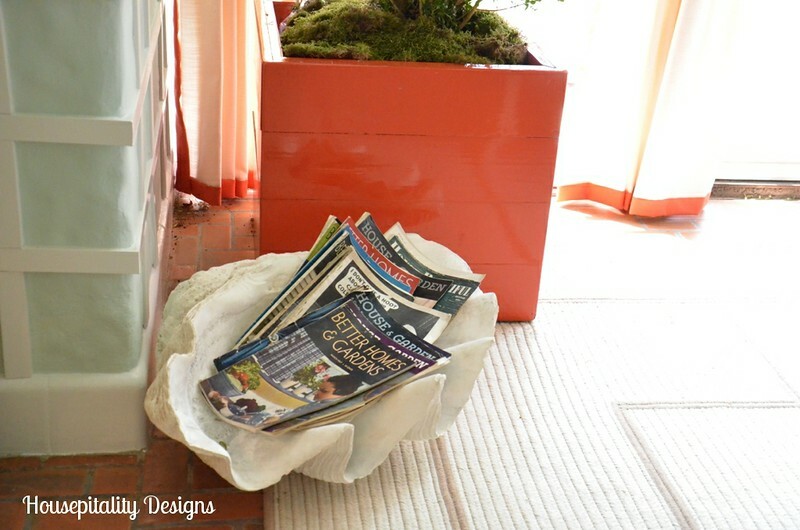 Obviously this is not a floral arrangement, but had to show you this fabulous clamshell that they filled with magazines. 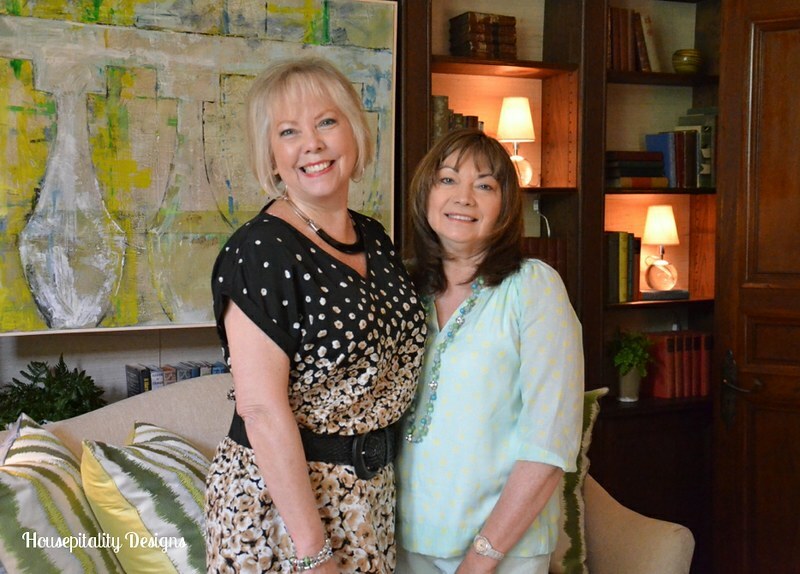 …..again, I just love the pairings of the floral arrangements and books…Dolores and Linda admiring it too. 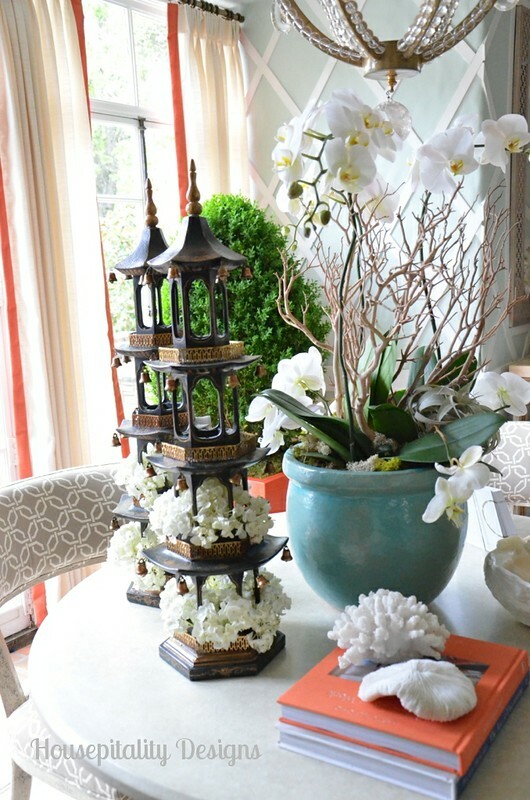 This vignette was one of my favorites with those globes…faux floral branches simply placed in a glass cylinder. 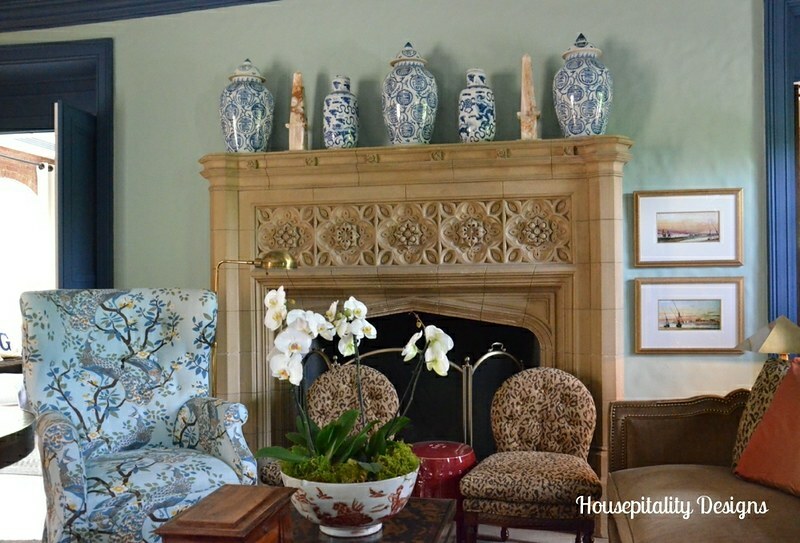 This is the main living room in the house…more of the magnificent blue and white porcelain. 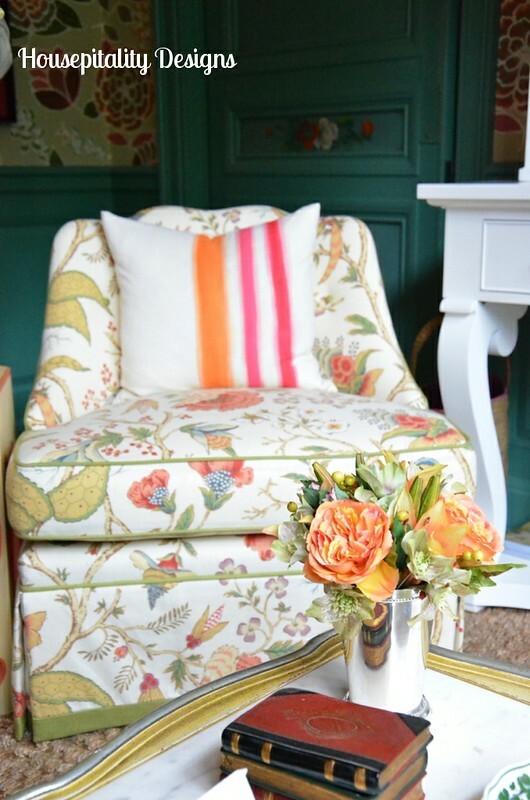 This sitting room was sponsored by Thibault…such a happy room. 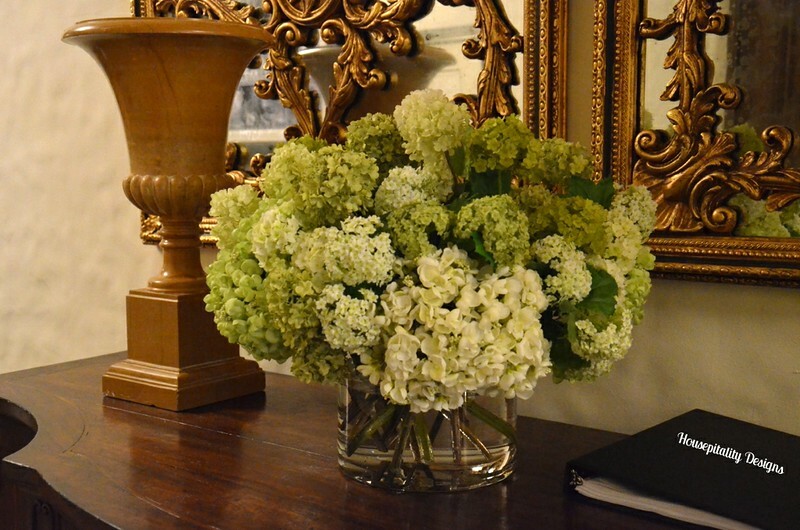 I do not know who had created all of these arrangements throughout the house, but they were just perfect for each room. The breakfast area located in the kitchen. 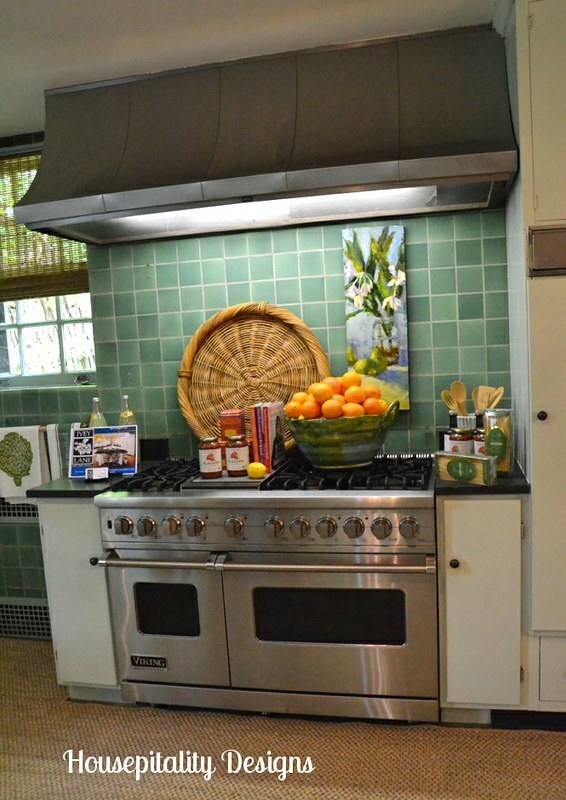 This huge bowl of oranges looked so fantastic on the stove…hmmm, do I really need to use all 4 burners? 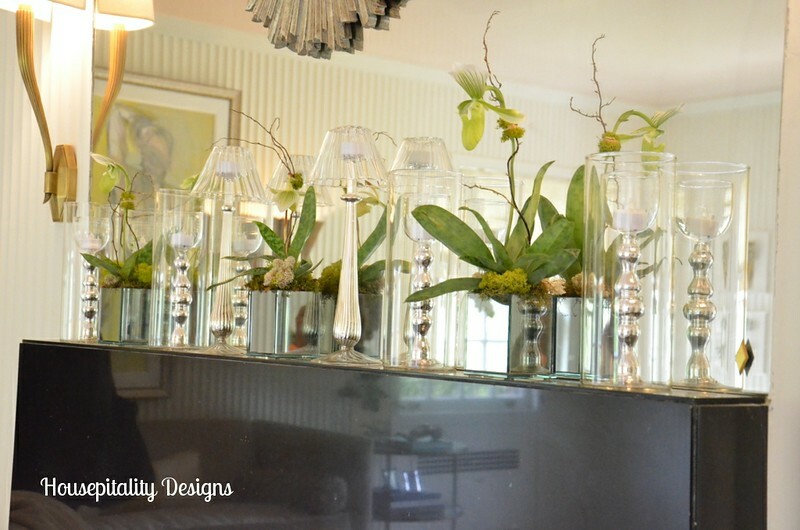 This mantel was amazing…it just sparkled!! …..I love this picture of Jackie who looked so beautiful and happy before tragedy struck her and our nation. 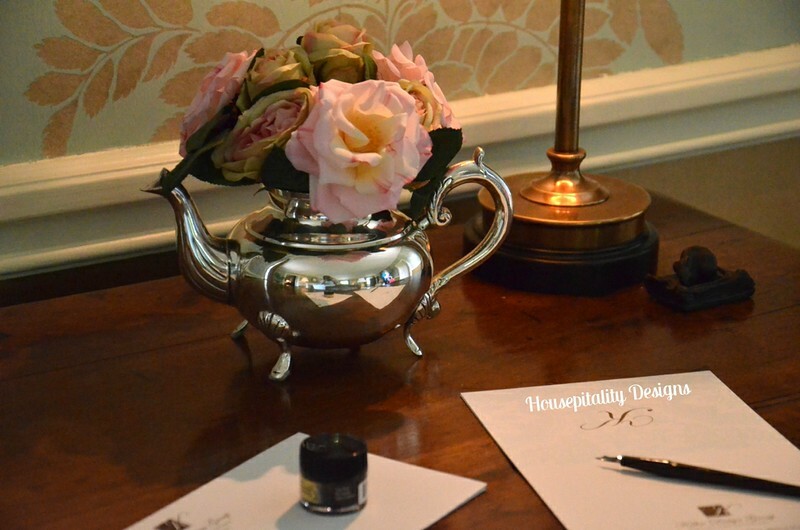 A simple arrangement of faux roses in a beautiful silver teapot on the writing desk. 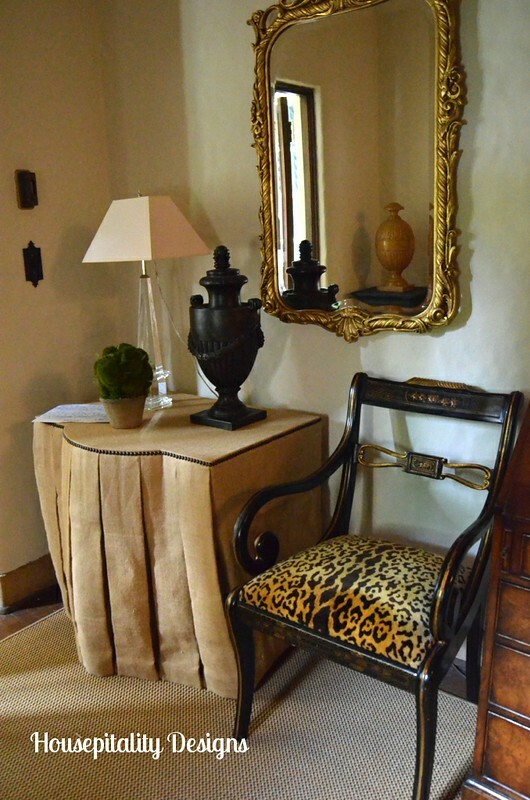 And even the most exquisite of homes has burlap decor…I love this skirted table with a simple boxwood arrangement. …..I loved how they incorporated the pods into this arrangement. 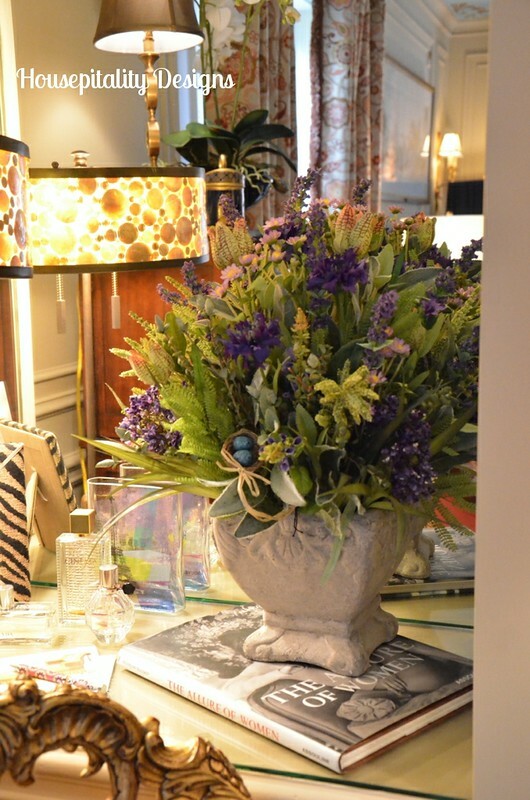 A stone planter of greenery embellishes this pretty vanity. 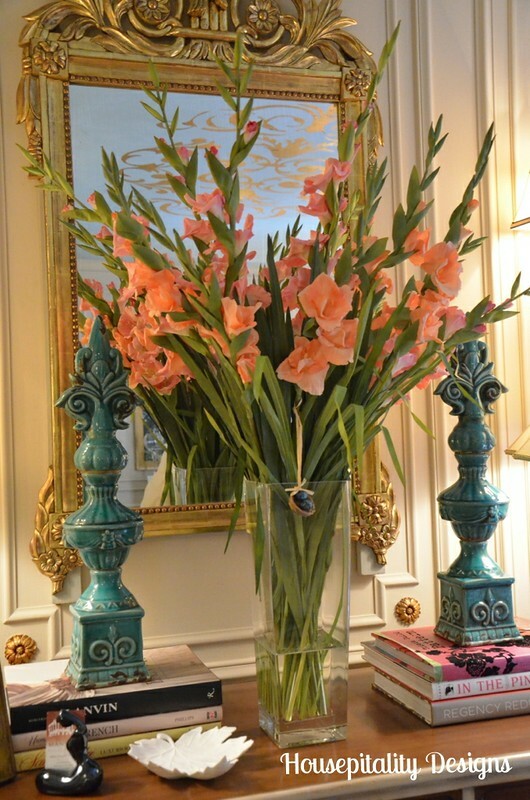 Who can resist this vase of faux gladiolas placed in front of that stunning mirror. 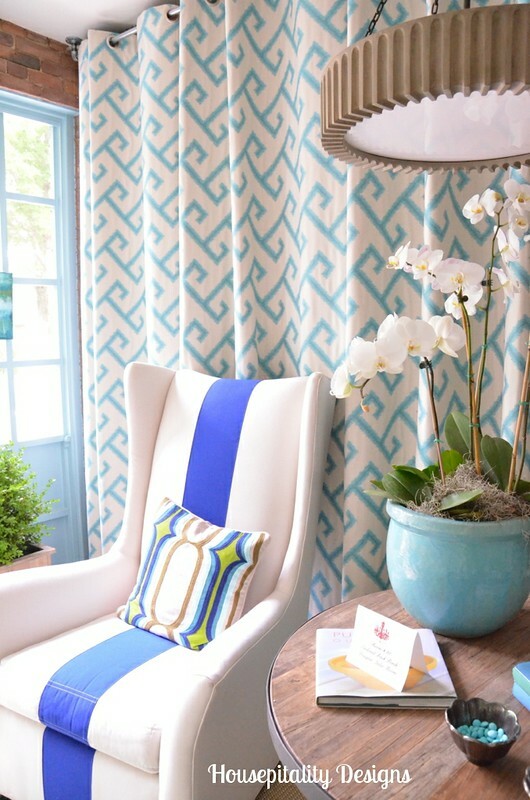 …..I truly love the colors and how it was impeccably created to coordinate with the drapes. 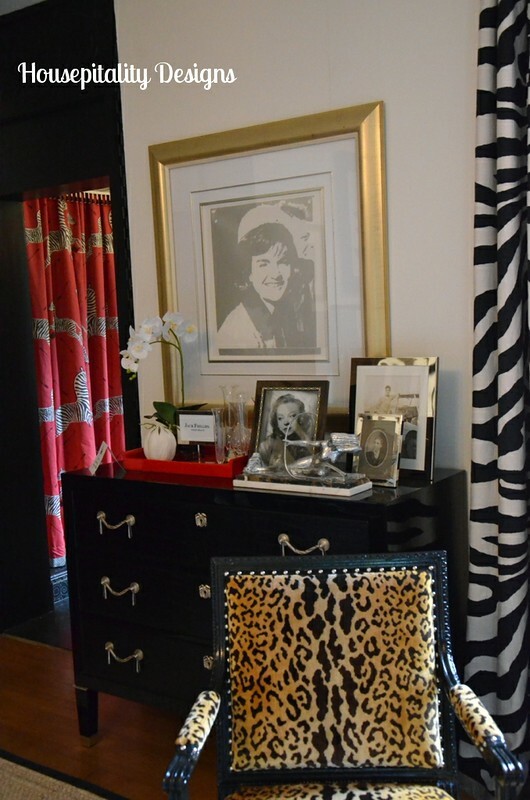 So Mr. Nate Berkus…who says that you cannot use faux florals in the house?!!.. 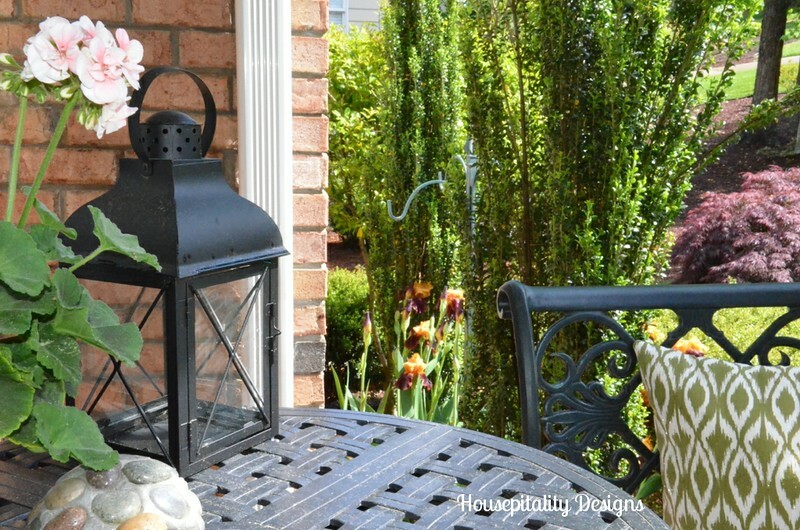 …..and believe me…I am such a Nate Berkus fan. 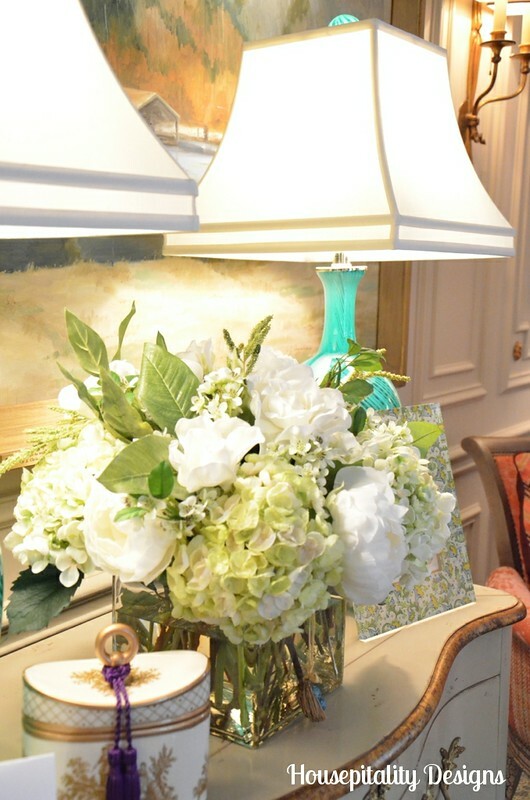 As these arrangements were carefully created for the spectacular designer rooms, such as Suzanne Kasler, Eric Cohler, Thibault, Scalamandre, and the list goes on…. Now, I must say that they need to be quality silks…the ones you have to touch to see if they are real or faux. 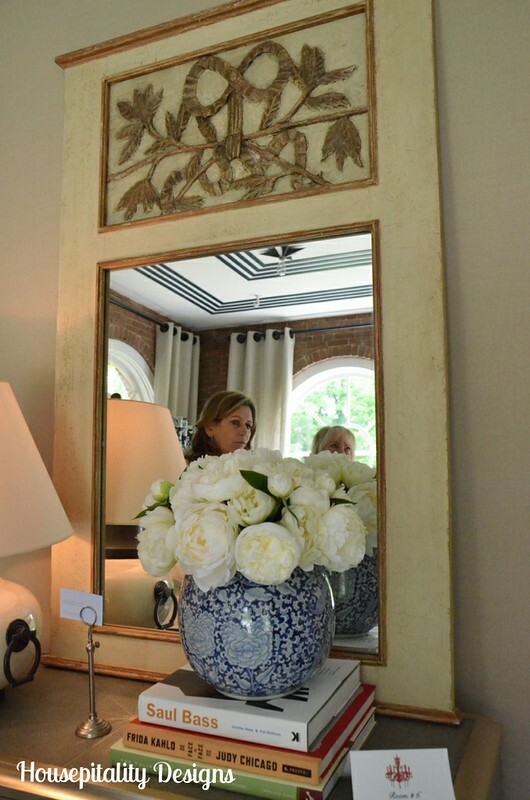 Hope you enjoyed these gorgeous floral arrangements that were in this incredible home called Adamsleigh in Greensboro, N.C. So, what say you? 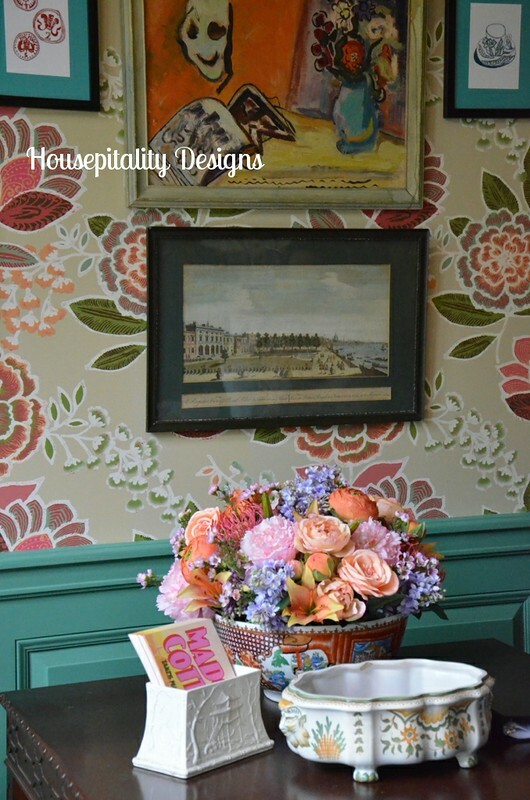 ?..are you a faux flower person? 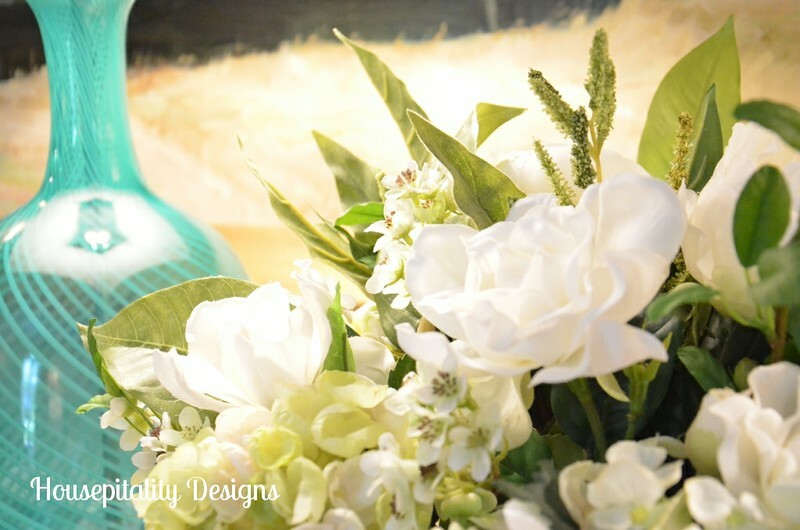 Have a wonderful day surrounded by the beauty of flowers, faux or real! !